Review by AllTheBestFights.com: 2015-05-30, some good exchanges between Francisco Trinaldo and Norman Parke but it is not enough to get three stars: it gets two. Francisco Trinaldo entered this fight with a pro mma record of 16-4-0 (62% finishing rate) and he is ranked as the No.49 lightweight in the world. He lost to Michael Chiesa last year but then he came back to win beating Leandro Silva and Akbarh Arreola. His opponent, the black belt in judo and 2012 Tuf Lw winner Norman Parke, has a record of 20-3-1 (80% finishing rate) and he entered as the No.52 in the same weight class. In his last three bouts he drew with Leonardo Santos (=Parke vs Santos), he won against Naoyuki Kotani and he lost to Gleison Tibau (via split decision, Tibau vs Parke). 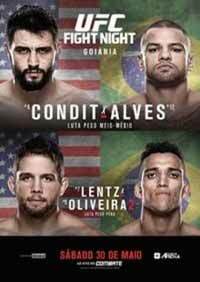 Trinaldo vs Parke is on the undercard of Carlos Condit vs Thiago Alves – UFC Fight Night 67. Watch the video and rate this fight!